Rodyna welcomes its first long-term Italian volunteers! Rodyna NGO is proud to announce that the long awaited Italian volunteers finally made it to Ukraine, and have been warmly welcomed by the whole team of the association. Alberto, Daniele and Sabina are going to spend one year in Kiev under the framework of the European Voluntary Service. The EVS programme promotes youth mobility and international cooperation in Europe, through the use of funds provided by the European Commission. Rodyna partnered with the Italian association ‘Eurogems‘, creating together the project which brought the three young Italians in the capital of Ukraine. In their first weeks in Kiev, the volunteers got to know the city and initiated their integration process, starting to get used to the new country, language and culture. Another very important part of the beginning of their Ukrainian adventure was the ‘On Arrival Training’, which took place in an Ukrainian-themed holiday village in Kiev Oblast. The training gathered other young people from all over Europe, who are currently doing their EVS in Ukraine, Belarus and Moldova. Along with fun activities and great Ukrainian cuisine, the volunteers got equipped with important skills that will help them throughout their entire EVS and beyond. Ready to start, here come the challenges. This is the first EVS experience for both the three volunteers and Rodyna, so they will have to face different challenges together. Alberto, Daniele and Sabina believe that one of the biggest difficulties will be to overcome the language barrier, so they already started to work on their Russian language in order to acquire a basic but very useful language level. 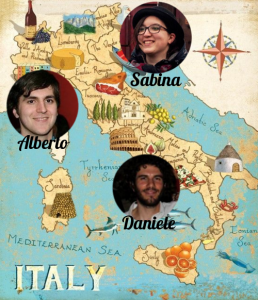 We wish good luck to the three young Italians in their stay in Kiev, following them closely in their EVS journey. This blog is also one of the projects that they will work on, so stay tuned for more news on the volunteers, the projects and the whole association.